Step foot on the Sandy Anna and come fishing with Cutawhiskie Charters! 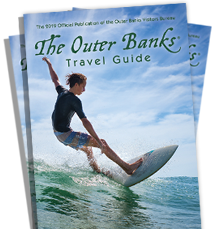 We will explore the sound, marsh flats, inlets, and Atlantic Ocean in one of the best areas on the east coast, The Outer Banks of North Carolina. Tackle the wide variety of fish species this area is blessed with, amongst an entertaining and laid back environment on a first class 26’ Center Console Mako. We accommodate novice and seasoned anglers. We are family friendly so children and families are always welcome! If you have a certain species of fish you want to target, or you just want to catch what’s biggest and biting best, we will make sure you have a great experience overall! Captain Clay will make sure you have the best opportunity to catch fish, and are comfortable onboard the vessel. The boat is equipped with a 200 hp engine, light tackle, top of the line Furuno GPS Navigation and Digital Imaging Fish finder electronics.